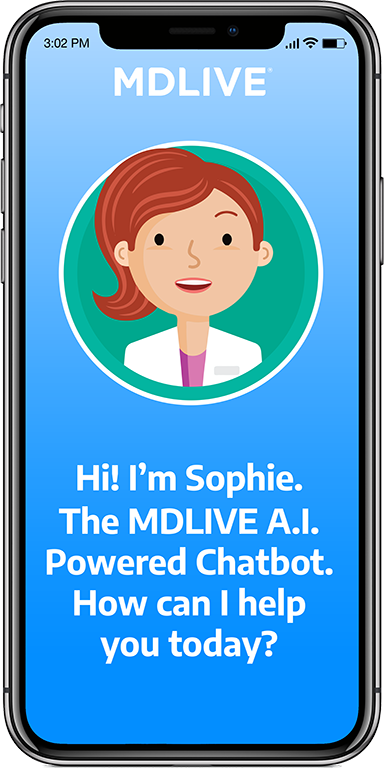 SUNRISE, Fla. (Nov. 29, 2017) – MDLIVE, a leading virtual medical and behavioral healthcare provider, today announced the launch of Sophie, an artificial intelligence-powered personal health assistant. This marks the first usage of a chatbot by a virtual care platform and a new method of increasing utilization among consumers by resolving one of the biggest barriers to adoption: registration. Sophie aims to improve the platform user experience by creating a tailored, conversational registration process for each individual. Conversation is initiated with a user based on demographics and information entered throughout the registration interaction. Sophie is just one of the breakthroughs marking the rise of artificial intelligence adoption in healthcare. The use of this technology can result in substantial improvements, including reducing costs, coordinating care more effectively, enhancing the experience between patient and physician and improving the overall consumer experience. For virtual care, artificial intelligence helps strike a balance between human interaction and technology, creating a more personalized experience for the consumer. For more information, visit the MDLIVE website or text ‘SOPHIE’ to MDLIVE (635483).